Mame Faye reportedly told young women of Troy, "Why work in a shop? Don't you know you're sittin' on a million." Troy's most famous figure may be Uncle Sam, but its second most famous, Mame Faye, ran a string of brothels across from Union Station. Filmmakers Penny Lane and Annmarie Lannesy (that's them below) just completed a documentary on Mame Faye called, "Sittin' on a Million". They gave us the scoop on how this business woman became a wold famous madam to the greatest generation. OK, so what are the facts about Mame? 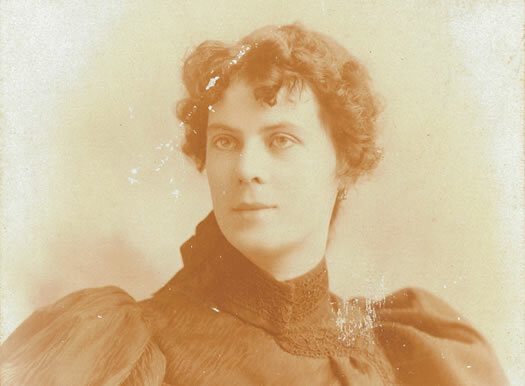 Born Mary Alice Fahey August 15, 1866. Listed in 1910 census as Widowed. Buried St. Joseph's Cemetery (Row 29, Plot 19). What are some of the things you heard that couldn't be confirmed? Much of what we heard could not be confirmed. For example, we heard that she was very generous and visited catholic church every Sunday. Well, the whole question of what constitutes a "confirmed" fact kind of makes my head spin. We are not journalists, nor are we historians. We are artists dealing with historical material about a real person, and getting most of our information through a lot of other people who sorta-kinda knew her a long time ago. More, Mame is a legend, pure and simple. She has her own attending mythology, most of which probably says more about the talkers than the thing they're talking about. I really don't know if one thing we heard is true or not. It's all very fun in that way. What is your favorite story about Mame? My favorite story about Mame is that one time she was carrying her duffel bag full of cash to the bank and some woman called out, "Hey Mame, how's business?" Mame shot back immediately, "It'd be a hell of a lot better if it weren't for amateurs like you!" I heard this from Judy Rowe out in West Sand Lake, who heard it from her boss forty years ago, who heard it from God knows who. This story is not necessarily about Mame as remembered by someone who knew her during her lifetime, but is a story about my own personal experience of Mame as an aura. The day I first visited St. Joseph's cemetery in hopes of finding her gravestone, I felt a tremendous energy and presence. I traipsed through the cemetery endlessly that day looking for her stone, with very little luck for a very long time. I decided to video tape my experience by recording my journey through the cemetery, some of which is included in our documentary. As I walked aimlessly through the cemetery with the camera in hand, I suddenly heard the camera's battery begin to beep alerting me that I was running out of power. I look down and the camera turned off. I look up and there stands her stone directly in front of me. A chill went through me. I felt that Mame was with me, and in her own way, telling me that she did not want her stone included in our movie. I felt very strongly for a good long while, that this cemetery footage was not to be included in any way shape or form. As time went on and word of our project began to spread, I was contacted by decedents of Mame, which developed into a friendship with one of Mame's Great-Grand nieces. Through this relationship as discoveries all around about Mame and her heritage were uncovered, it was decided 63 years after Mame's death, by Mame's loved ones,that her stone was to finally be engraved. After the engraving, I felt it was OK to use the cemetery footage in the movie. I for the first time felt at peace with the project and resolved Mame's story for me in way that had not been before. Troy besides Uncle Sam. What was it about her that made her world famous? You know, I really don't know! I have a few hunches. First of all, you have to remember that Troy was a real center of the Industrial Revolution, a seat of power for both military and industrial forces. World Wars I and II meant that troop trains came through town, and RPI had the ROTC programs, and Mame's place was literally just across from the train station. So many, many people came through here, and took their tales with them in their travels. Second, she was in business for close to forty years! We hear about other madams, but none with that kind of staying power. Third, people seem to really just love her, like her, admire her. She's remembered as generous, kind, giving to the poor and to children. Fourth, she stands as a symbol of "Old Troy" for so many locals, a happy memory to direct their nostalgia toward. All of these things seem to have converged to make her a legend. I would like to speculate that it was her intrigue, her charisma and her savvy business sense that made her 'world famous', but in all honesty I simply think it was her proximity to Troy's Union train station, as the trains carried Mame's customers and their stories onward around the country, and from there on across the world. The topic is kind of charged. Did the film stir anything up in Troy? What it seems to have stirred up in Troy is a woman's history long forgotten. Mame's story reclaims part of the histories of the extraordinary ordinary people whose lives who are often removed for the official records. It also seems to have stirred up a good deal of talk about the long forgotten thriving red light district and Troy's history of open prostitution to a generation of people who knew little of its existence. Sure it has. Some local people want to know why we would spend time and effort "celebrating" a person like Mame Faye when city officials are working so hard to shore up Troy's image as a kind of Norman Rockwell painting frozen in time. Some people think that by doing this film, we are doing Troy a disservice. But mostly the response has been overwhelmingly positive. People love Mame Faye. Clips of "Sittin' on a Milion" are available at Annmarie and Penny's website. Both photos courtesy of Penny Lane and Annmarie Lannesy. I heard about Mame Fay and always enjoy reading things about her. I'm from Troy, N.Y. and I think it's wonderful to blend other things into the "Norman Rockwell " picture that the city is trying to paint. Leaving this fascinating woman out of the picture does not mean she never existed. My mom told me that when she and my dad traveled in the 40s, they said they were from Albany because Troy had a bad reputation. Now I know the rest of the story. Oh, that Mame!